After just three months of iPhone supremacy, Android is back as the top-selling mobile operating system in the U.S. Phones running Android jumped to 49.4 percent of all smartphone sales in America, up 6.4 percent over the same period a year ago. iOS came in second, of course, with 45.9 percent. Interestingly, Windows Phone was the only other mobile operating system to grow, adding over a percentage point of market share, while BlackBerry dropped to only a third of its previous share, to only .9 percent of the market. 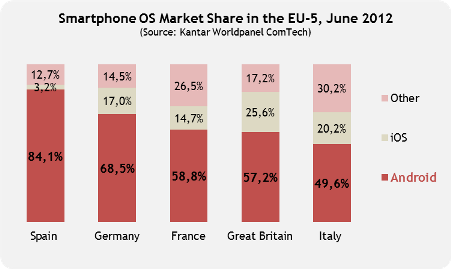 The latest data from Kantar Worldpanel ComTech shows that for the first time Android has taken at least half of smartphone sales in Great Britain, Germany, France, Italy, Spain, USand Australia. 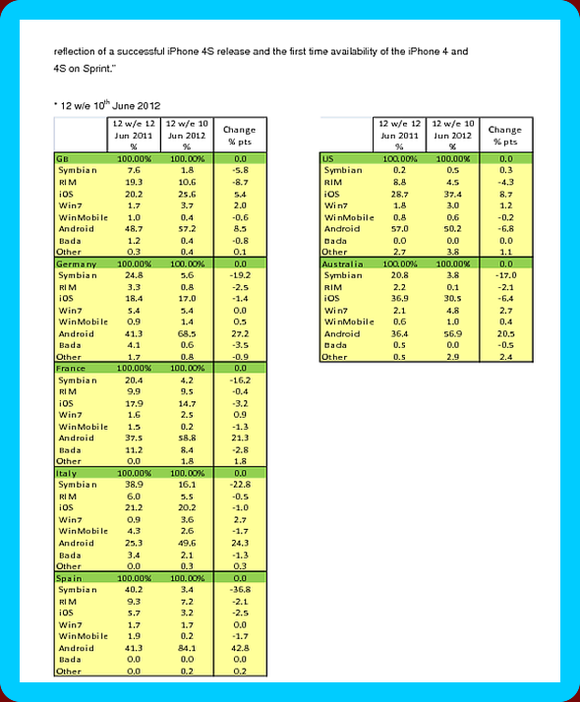 * Android's share now ranges from 49.6% in Italy to a massive 84.1% in Spain. Nokia launched its first mobile phone — the Mobira Talkman –- in 1984. Weighing just over 11 pounds, the phone was revolutionary for its time. A little over 20 years later, in 2005, the company introduced its first multimedia smartphones, and in 2011 it introduced the Lumia line, the first Windows Phone handsets. 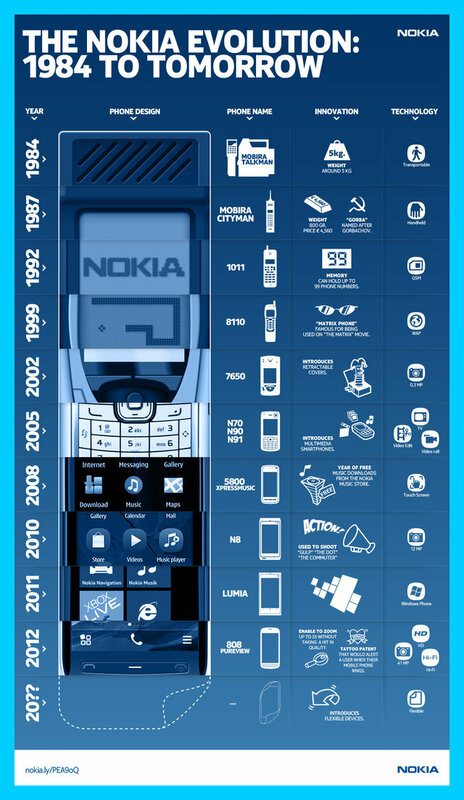 Check out the infographic below for a look back at Nokia from 1984 to today. 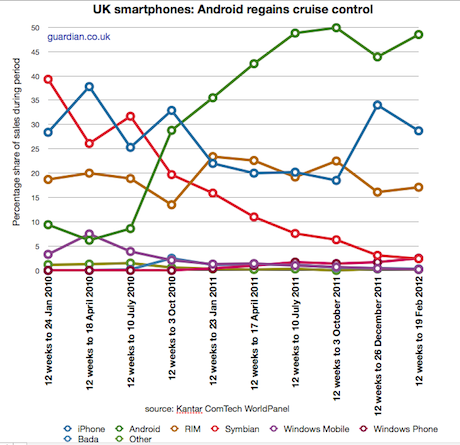 According to the latest data from Kantar Worldpanel ComTech, Android is the number one smartphone operating system in European countries. 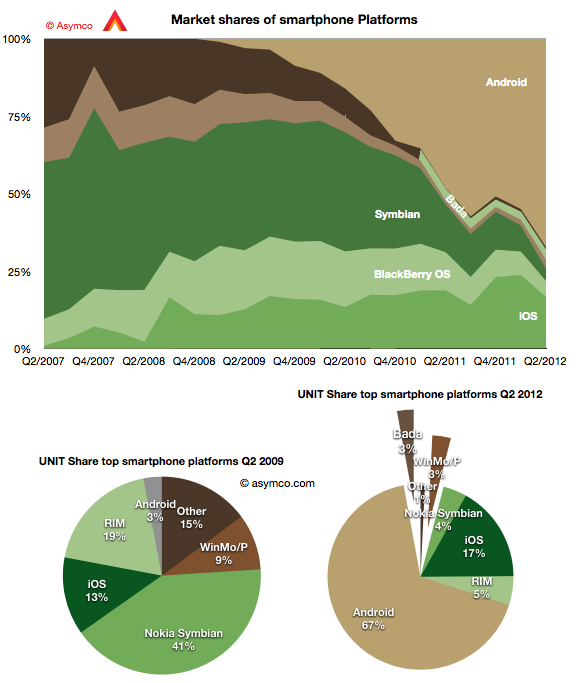 Android’s share of smartphone sales now ranges from 49.6% in Italy to a massive 84.1% in Spain. The “before-and-after” pair of pie charts which show the difference in smartphone platform market share from the same quarter three years ago. 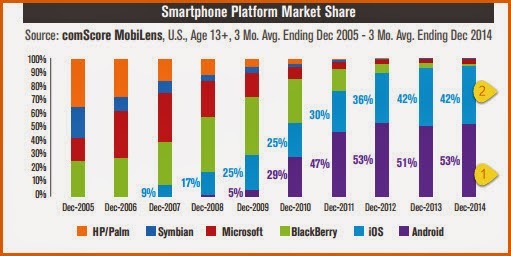 Android went from 3% share to 67% while Symbian went from 41% to 4% and RIM went from 19% to 5%. iOS increased its share from 13% to 17%. 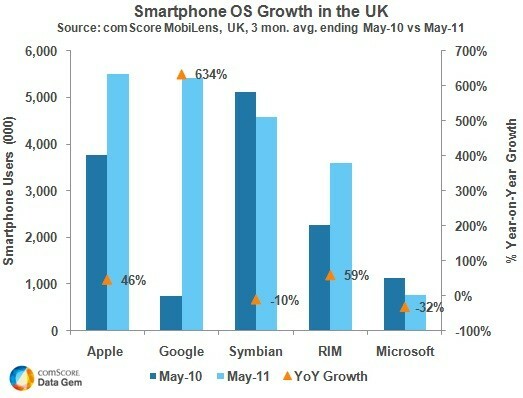 If this trend continues Android could reach 50% of all phones sold in a few years. That’s a run rate of 200 million per quarter.  And it’s likely that 100 million of those will be shipped by Chinese vendors. 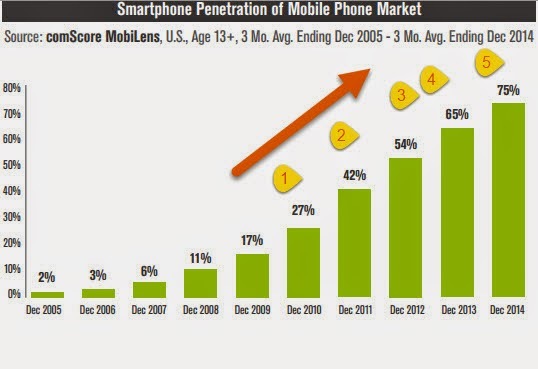 What affected the global market was a change in the US: the launch of iOS and thereafter of Android. The US, a smartphone backwater until then, became the most vibrant market and today it’s the most penetrated and has the highest ratio of smart to non-smart of any of the major regions.